Abu Dhabi, United Arab Emirates: Moorfields has exhibited the seven winners of the UAE Sense of Sight art competition marking World Sight Day 2016. The winning artworks were displayed first as white 3D panels with just the contours of the picture challenging visitors to ‘feel’ the picture, before the real image was revealed and appreciated through the sense of sight. The two exhibitions were hosted at Ayyam Gallery in Dubai and Salwa Zeidan Gallery in Abu Dhabi. 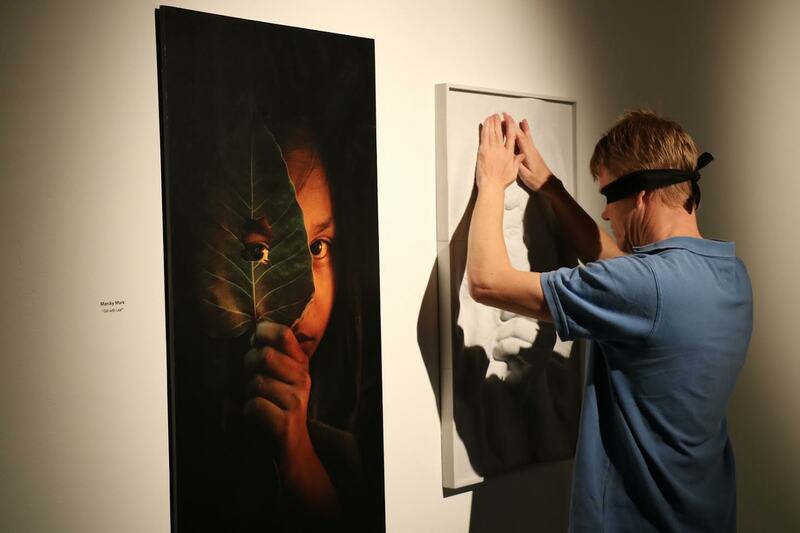 Visitors to Moorfields’ Sense of Sight gallery shows in Dubai and Abu Dhabi were first blindfolded and then guided around the exhibition gallery to each of the seven winning 3D artworks, they first felt the 3D artworks before they saw the real 2D artworks. From shapes and images of the Burj Khalifa to the Grand Mosque in Abu Dhabi, from animal forms to human figures and more complex combinations, visitors tested their sense of touch before sense of sight. The Sense of Sight competition and exhibitions were designed to highlight and appreciate the gift of sight, to mark World Sight Day 2016. Moorfields Eye Hospital Dubai and Moorfields Eye Hospital Centre Abu Dhabi invited the UAE professional design and arts community and budding young artists to share their new and original artworks, images, and photographs, in celebration of the sense of sight. Artists and photographers were asked to look at the world in its full three dimensions and think about how to express this visually and in a way that would intrigue viewers first by touch and then sight. Moorfields received hundreds of entries comprising photographs, designs and paintings – portraits, landscapes and abstracts. Seven selected winners had their work produced by Moorfields in 3D, and displayed in unique tactile art shows which were free of charge and open to the public, held at Ayyam Gallery, Al Quoz in Dubai for three days (October 27-29), and Salwa Zeidan Gallery in Abu Dhabi, (November 5-6). One of the winners – an engineer based in Dubai – had submitted his dramatic nightscape photograph of the Grand Mosque, one of the easier 3D renderings for visitors to feel their way around, given the iconic shape and form of the Mosque. Moorfields Eye Hospital Dubai (MEHD) is the first overseas branch of Moorfields Eye Hospital NHS Foundation Trust, the oldest and one of the largest centres for ophthalmic treatment, teaching and research in the world. Located at the Al Razi Medical Complex in Dubai Health Care City, the facility provides day case surgery and outpatient diagnostic and treatment services, for a variety of surgical and non-surgical eye conditions. MEHD will also raise standards for research and teaching in the region. MEHD is owned and managed by the NHS Foundation Trust, and maintains close links with London, to ensure that patients in the GCC receive the best eye care treatment in the world. Moorfields Eye Hospital Centre in Abu Dhabi is a partnership between Moorfields Eye Hospital NHS Foundation Trust and United Eastern Medical Services (UEMedical), a leading privately-owned Healthcare Development & Investment Company in Abu Dhabi. Moorfields Eye Hospital in London was founded over 200 years ago and is the oldest and one of the largest centres for ophthalmic treatment, teaching and research in the world. Moorfields Eye Hospital Centre in Abu Dhabi is the first Moorfields medical facility to be opened with a partner and the second in the UAE, following the opening of Moorfields Eye Hospital Dubai in 2007. Moorfields Eye Hospital Centre in Abu Dhabi provides a comprehensive range of specialist ophthalmological services, including surgical and non-surgical treatments for common and complex eye conditions in children and adults, including strabismus, glaucoma, retina (medical and surgical), oculoplastics (including cosmetic surgery around the eye), corneal and refractive (vision corrective surgery). All treatments are carried out on a day case basis. A team of highly experienced and qualified consultant ophthalmologists, many of whom trained and practiced at Moorfields in London, is based permanently in the UAE to provide treatment and follow up to patients, supported by medical staff and customer services team, with advanced equipment and technology for the diagnosis and treatment of the most complex eye conditions.